Primitive Baptist Library: 200th Anniversary of Bethel Church, Jackson, Missouri & Flatboat "Journey of Remembrance"
A flatboat journey by a descendant of early Thompson family members of Bethel Church, in remembrance of the Primitive Baptist heritage they have in this pioneer church for Missouri, has now ended. A commemorative service was held at the Summer Cemetery, near Cape Girardeau, Missouri, in honor of Elder Wilson Thompson, Jeremiah Thompson, and Elder Benjamin Thompson, on December 17, 2006. 200th Anniversary of Bethel Church, near Jackson, Cape Girardeau County, Missouri, organized July 19, 1806. Photo taken near Fairbanks, Indiana, in November 2006, by Robert Webb. 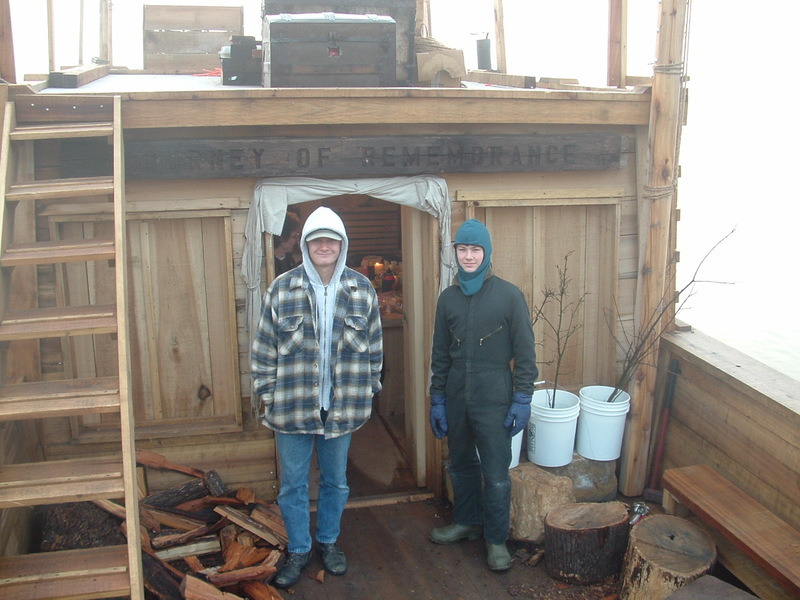 Brother Ron Drake (eldest son of Elder Mervin E. Drake, of Indiana, who is also well known in Missouri, Illinois, and Iowa) has now fulfilled his plans for a journey of remembrance, on the flatboat which was built earlier this year on the Jeremiah Thompson farm next to the old original homesite, near Fairbanks, Indiana, using timber from that farm. 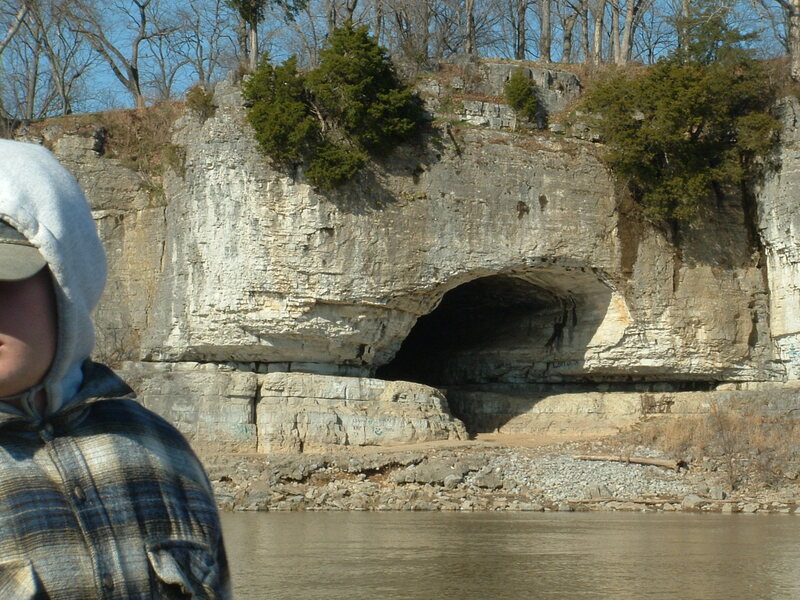 The trip on the Ohio and Mississippi Rivers, from Cincinnati to Cape Girardeau, in remembrance of the difficult and dangerous journey made by Elder Wilson Thompson and others of the Thompson family in 1810 is now history itself. Brother Ron Drake is a descendant of Closs Thompson (father of Elder Wilson Thompson), and of his son Jeremiah Thompson (brother to Elder Wilson Thompson). Elders Wilson Thompson and Benjamin Thompson served as pastors of Bethel Church for much of its existence, and others of the Thompson family, including Jeremiah, were members there. A documentary of the trip is being made. We have presented a few photos below. The descendants of Closs Thompson, have the right to claim their heritage at Bethel Church, both from a church and family standpoint, and they are proud to be known as Hardshell Baptists. There were no fundraisers, and contributions were not solicited or accepted, as the endeavor was strictly in honor of their Thompson ancestors. 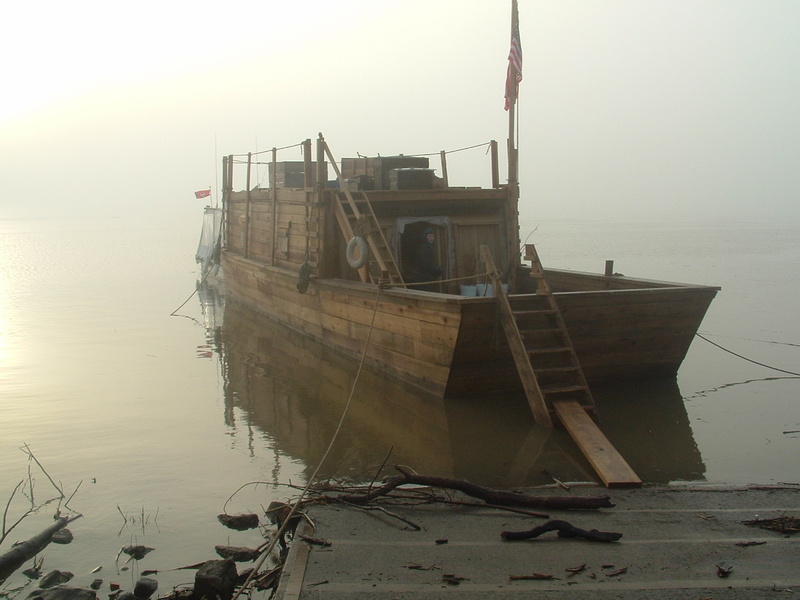 The flatboat, "Journey of Remembrance," is 12' wide and 42' long, with a cabin on top. The name, "Journey of Remembrance," is engraved on the historic log above the door. It was built at the lake on the old Jeremiah Thompson farm in Indiana. 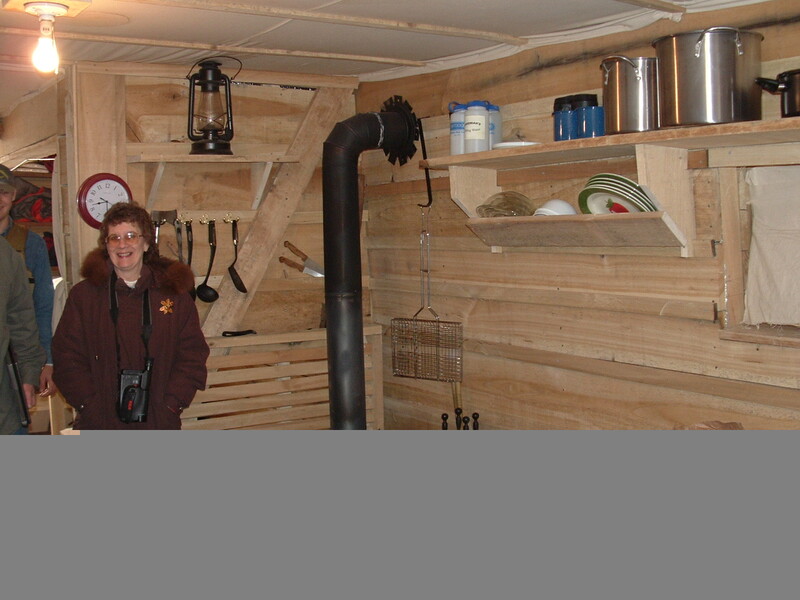 It was christened with spring water from the spring on the Jeremiah Thompson farm. When the journey began, it was taken to the site where the original trip (it is believed) began, near the confluence of the Little Miami and Ohio Rivers. 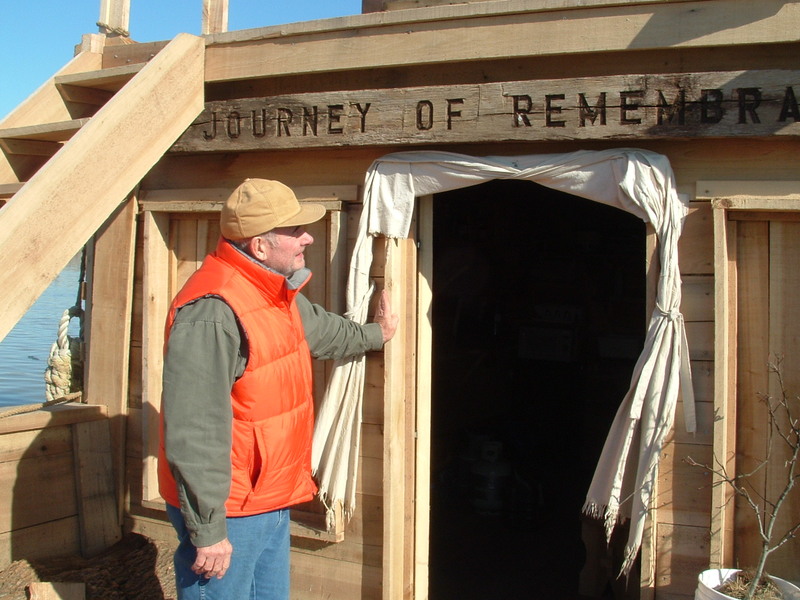 The "JOURNEY OF REMEMBRANCE" began about December 2, 2006, at Little Miami (Ky./Oh. ), off I-275. Points along the way included the Rising Sun Marina (Ind. ), Markland Lock (Ind. ), Madison (Ind. ), McAlpine Lock (Ind. ), New Albany Ramp under Bridge (Ind. ), Leavenworth (Ind. ), Tell City Ramp (Ind. ), Cannelton Lock (Ind. ), Grandview (Ind. ), Newburgh Lock (Ind. ), Evansville (Ind. ), Mt. Vernon (Ind. ), John T. Myers Lock (Ind. ), Old Shawneetown (Ill.), Cave in Rock (Ill.), Elizabethtown (Ill.), Smithland Lock (Ill.), Metropolis (Ill.), Lock 53 (Ill.), Ft. Defiance State Park (at the confluence of Ohio and Mississippi Rivers); Turning up the Mississippi River: Elkins Landing on Price Landing (Mo. ), Cape Girardeau (Mo.). The trip ended at Cape Girardeau. 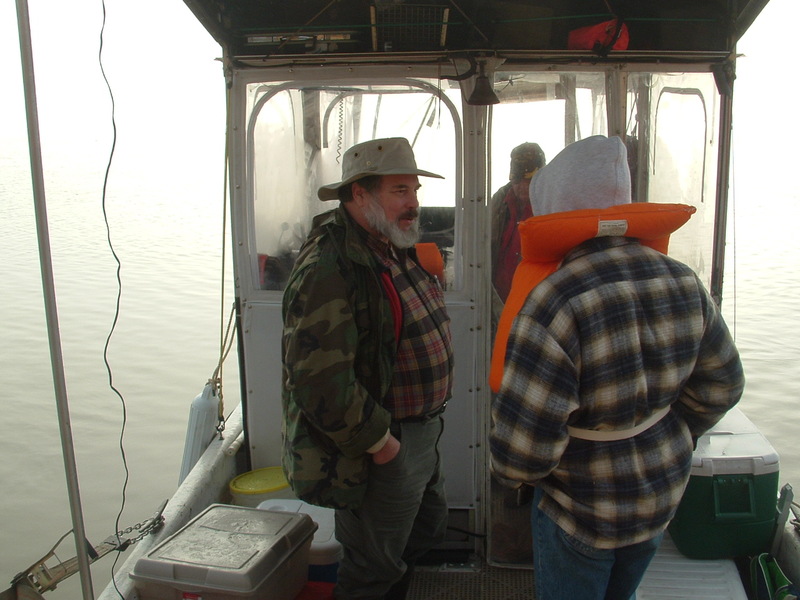 Great difficulty was encountered from the weather at first, which then moderated, and great danger arose again going against the current on the Mississippi, but the boat and crew met the test and arrived at their destination safely. on the log from the old Bethel Church meeting house which was mounted above the door of the flatboat's cabin. 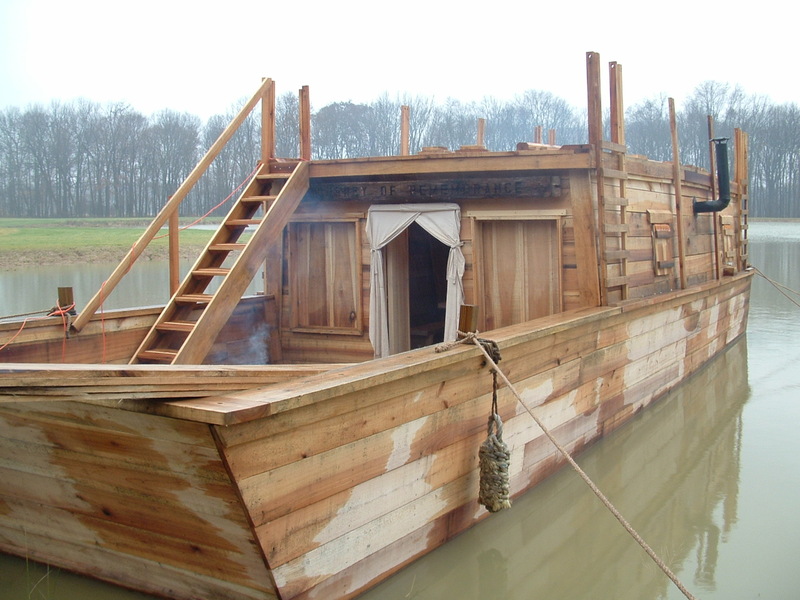 The flatboat was constructed from timber on the Jeremiah Thompson farm in Indiana. Photo taken in November 2006 near Fairbanks, Indiana, by Robert Webb. 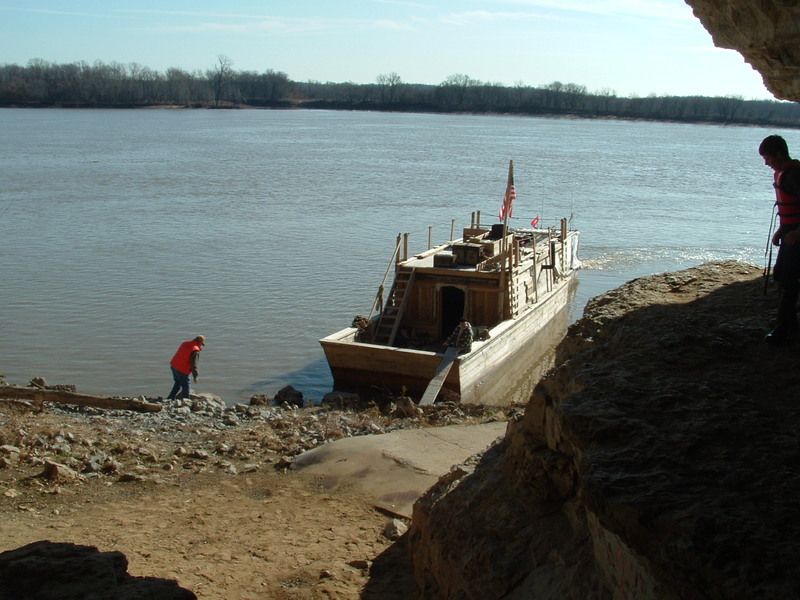 Elder Wilson Thompson was 22 years old when he made this journey by flatboat. Elder Wilson Thompson. Others who came by flatboat with him, in 1810, included his wife, Mary Grigg Thompson; his father and mother, Closs Thompson Jr. and Rebecca Wilson Thompson; his oldest sister (Jane); and children (presumably his younger brothers and sisters, or perhaps cousins) are also mentioned but not by name. Elder Wilson Thompson's brother, Jeremiah Thompson, and a cousin, John Reynolds, came by land, at the same time, to bring the horses. Photo taken from the Autobiography of Elder Wilson Thompson. 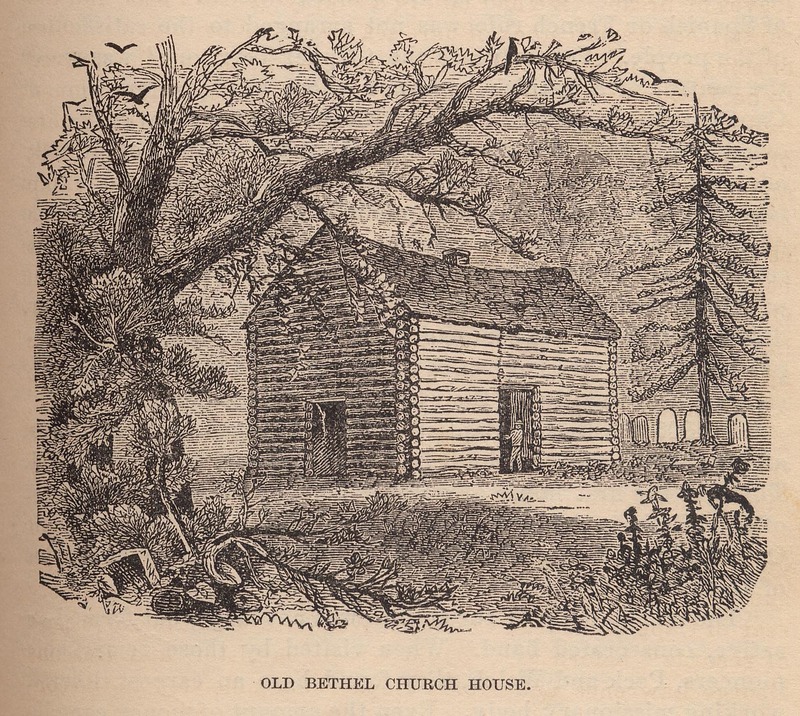 Drawing supposedly of old Bethel Church near Jackson, Cape Girardeau County, Missouri, but not historically accurate. Taken from R. S. Duncan's History of the Missouri Baptists. The Missouri Baptist Convention is presently rebuilding the old log cabin church. The second* Baptist Church organized in Missouri Territory was called Bethel, which was organized on July 19, 1806, near Jackson, in Cape Girardeau County. Bethel Church continued to be affiliated with the Regular Baptists, or what is now known as Primitive Baptists, throughout its existence. Elder Wilson Thompson, a well-known Primitive Baptist minister, and Elder Benjamin Thompson, his uncle, were two of the men who served as pastors of Bethel Church. The Missouri Baptist Convention (Southern Baptist) obtained ownership of the site, a few years ago, and is presently rebuilding the log meeting house. They know that Bethel Church was constituted by Predestinarian Baptists, and they acknowledge that Bethel Church stood with the Primitive Baptists at the time of the division in the Cape Girardeau Association in 1840. We are presently in the process of reproducing an early edition of Elder Wilson Thompson's Autobiography, published by D. H. Goble. 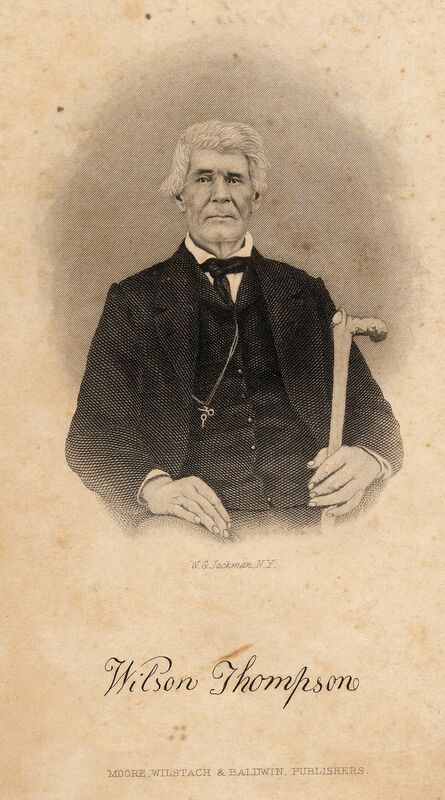 The Primitive Baptist Library Quarterly will publish nearly 100 hymns composed by Elder Wilson Thompson, which appear in his Baptist Hymn Book copyrighted in 1844. Our copy is an 1850 printing. We also have a transcript of the records of Bethel Church, which shows that the church held to Primitive Baptist beliefs from the beginning. At the time of his trip to Missouri in 1810, Elder Wilson Thompson was 22 years old, and his library at that time consisted of a small Bible, Rippon's hymn book, and Pilgrim's Progress. Copies of these three books will be taken along on the flatboat journey. * The first Baptist Church in the territory was called Tywappity Bottom. It was organized in about 1804-1805 by Elder David Green. It was still in existence in 1837, as it hosted the Cape Girardeau Association that year. BROTHER BEEBE:-Please publish the obituary of JEREMIAH THOMPSON (brother of Elder Wilson Thompson, of Indiana) who died at his residence, in Sullivan county, Indiana, May 4, 1862, aged seventy-one years. He was born May 4, 1791, and died on his birthday. His disease was scrofula, he suffered much, but complained none. He was baptized in about the year 1810. He was a very useful member of the church, as long as he lived. He held the office of deacon many years. He has left a bereaved widow, and eight children, all grown up, of which four are married, and four are single, all of whom feel their bereavement. Your brother, ELIJAH STAGGS. Turman's Creek, Indiana, May 8, 1862. - Copied from "Signs of the Times." BROTHER BEEBE:-It becomes my painful duty to inform you and the household of faith, through your medium of correspondence, of the death of one of Zion's old and faithful watchmen, ELDER WILSON THOMPSON, who fell asleep in Jesus May 1st, 1866. He was born August 17, 1788, in Kentucky, and at the early age of thirteen was circumcised with the circumcision made without hands, receiving the spirit of adoption, whereby he could cry, Abba, Father, and was baptized by Elder James Lee. At the age of 22 he began his public career as a minister of the gospel, and for 56 years devotedly giving himself wholly to this work of the ministry, as thousands who have sat under his ministry, growing in grace and in the knowledge of the truth, can testify. A kidney disease growing upon him seemed to impress his mind sensibly with approaching death for some months, but with a remarkable constitution and strength of lungs, and zeal unabated, he continued to preach Christ and him crucified, until about one week before he died. His last labors was with the Antioch and Ross Run churches, Wabash Co., Ind., where it pleased the good Lord to pour out his spirit; additions were made to the church, and he seemed to almost forget his infirmity, with the joy and praise that filled his soul on seeing the salvation of the Lord. He was taken down away from home, but by medical assistance was partially relieved, so as to get to his son, James Thompson, in Howard county. He spoke of his disease, his worldly affairs, and approaching death with the utmost composure and resignation to the Lord's will. His physician expressed some surprise at his strong faith and confident assurance in God, his Saviour. He replied, "My God never changes." About 18 hours before he died he aroused in severe convulsions, for about half an hour suffering intensely. He cried out, "O, Lord, I pray, I pray;" and fell asleep, from which no groan, or sigh, or conscious suffering escaped till his breath left him. Truly one of the mighty in Israel has fallen. He leaves a frail companion, nine months younger than himself. May God support her in this sad hour till it is his will to take her to his embrace. An appropriate discourse was delivered by Elder J. G. Jackson from the words,"Write, Blessed are the dead which die in the Lord from henceforth; yea, saith the spirit, for they rest from their labors, and their works do follow them." After which the remains were deposited in the graveyard at Russiaville, Howard County, Indiana. Departed this life the 31st day of December, 1853, Elder Benjamin Thompson, aged eighty years. He joined the Regular Baptist Church called Bethel near Jackson, in Cape Girardeau County, Missouri, on February 8, A. D. 1812, and was licensed to preach the gospel on June 8, A. D. 1822, and was ordained a minister of the Gospel, March 12, A. D. 1825; and September 9, A. D. 1826, was chosen pastor of said church, and remained pastor until the day of his death. Elder Thompson as a preacher was sound in the faith that was delivered to the saints. His life was an example to all people that knew him. When at home he was engaged in working on his farm at peace with all his neighbors, and when out preaching the word, he freely gave it, for as much as it was given to him freely, so he made the Gospel without a charge. Believing with all his heart that it was his duty to preach wherever his mind led him, if any opportunity served, and so he did, all the time, till his age and weakness became so that he had to stay at his own dwelling, where he was kindly waited on until the messenger of death was prepared to separate his spirit from his body. Blessed are the dead that die in the Lord, yea, saith the Spirit, for they shall rest from their labour, and their works do follow them. He left a wife and one son and grandson on the farm, and other children scattered about with many brethren and neighbors and friends to mourn his loss. Copied from Minutes of Bethel Church, Feb. 11, 1854. 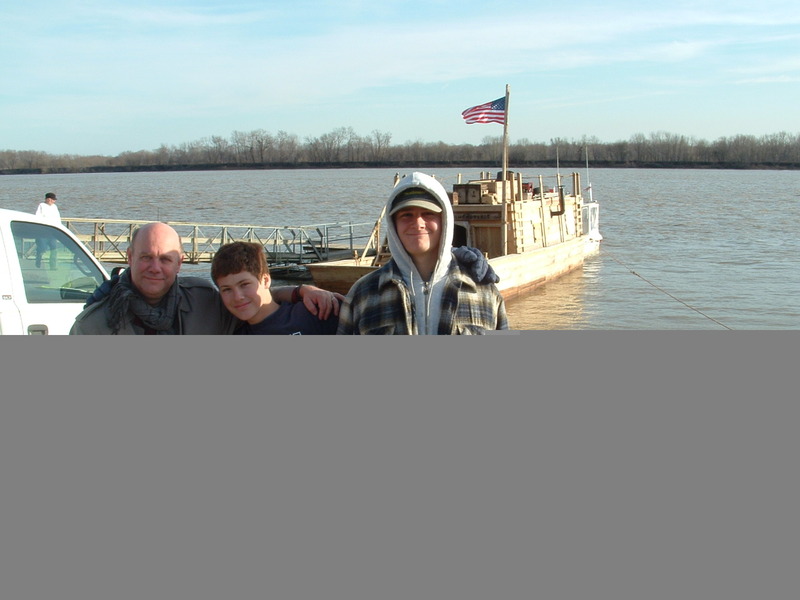 A few of us from Carthage, Illinois, boarded the flatboat on December 13th, as guests of Ron Drake. The journey that day was from Old Shawneetown, Illinois, to Elizabethtown, Illinois, including a short stop at Cave-in-Rock. Bethel Church, near Cape Girardeau, Missouri, and Big Creek Church, near Elizabethtown, were both organized two hundred years ago this year, on July 19, 1806. We appreciate the privilege to honor Elders Wilson and Benjamin Thompson, and all our pioneer forefathers whose labors were blessed, in this way. May God continue those blessings upon us, in our day, and while time lasts. Copyright c. 2006-2019. All rights reserved. The Primitive Baptist Library.